Analysis of thermal conductivity・thermal diffusivity | ADVANCE RIKO,Inc. Accurate measurement of each sample and measurement direction is available with meeting various needs in sample size from bulk to 20nm-thin film. measure thermal diffusivity of a sample from temperature response on the backside of the sample after laser-pulse-heating the front side of the sample. Xe flash method is used to measure thermal diffusivity of a sample from temperture rise on the backside of the sample after xenon-pulse-heating the front side of the sample. 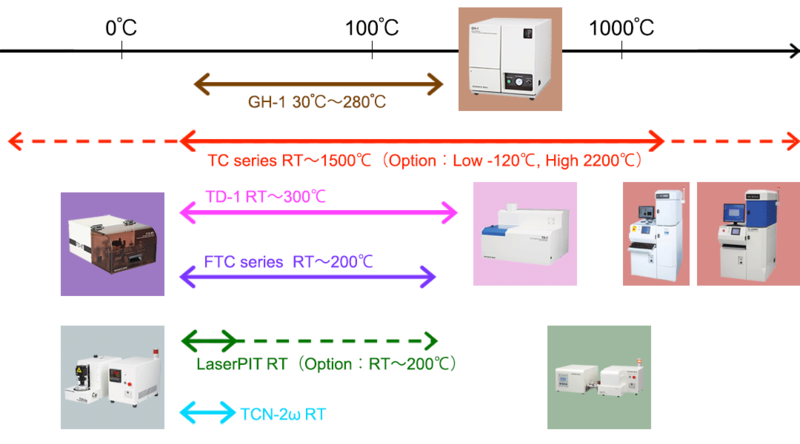 Scanning laser heating AC method / Apply a band of laser to the surface of a thin film sample periodically and then evaluate the thermal diffusivity of the sample in-plane direction. Apply periodic heating to a sample and then evaluate the thermal diffusivity of the sample from the temperature behaviour caused by periodic temperature change. keep steady temperature gradient on a sample by applying higher temperature at one end of the sample and lower temperature at the other end and then calculate thermal conductivity after measuring the temperature. *Quote separately for 5 temperature points or more. 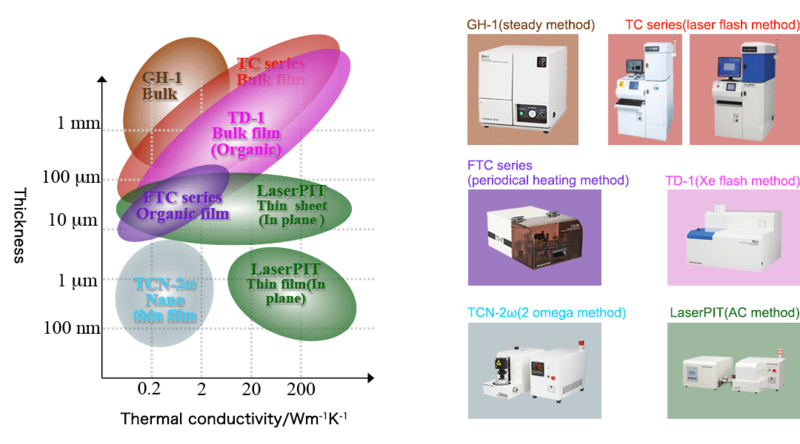 By detecting thermal amplitude with thermo-reflectance method, thermal conductivity of an insulating film on the substrate can be measured in thickness direction. Seebeck coefficient and thermal conductivity (in-plane direction ) can be measured. room temperature ＋ 5℃ air max. square 20mm, thickness 5mm Quote separately.